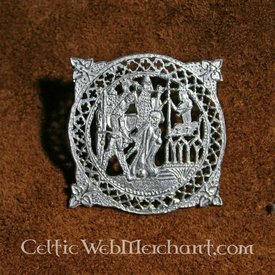 This pewter badge is a replica of several 14th century badges. The badge shows Thomas Becket returning to England in 1170 after his six year exile. 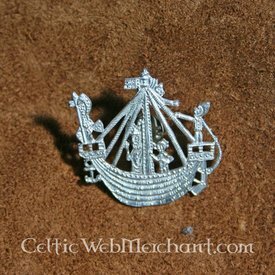 The badge shows a cargo ship, Thomas Becket stands at the middle of the ship with his hands elevated in blessing. The badge measures 4,5 cm. 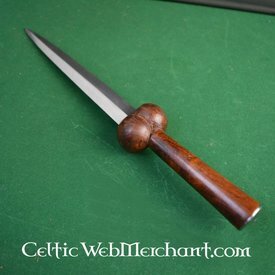 Sir Thomas Becket was the son of a London merchant. He studied theology in Paris and became chancellor of King Henry II of England in 1155 and archbishop of Canterbury in 1162. 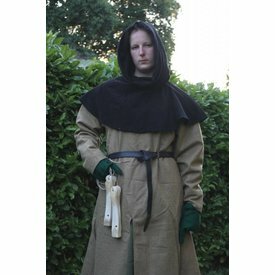 In 1164 he fell from the king's grace and was prosecuted. Bucket fled to the continent, where he stayed at the Abbey of Pontigny. The pope forced Henry to a compromise with Becket, after which he was able to return to England. At the same year four Norman knights took a lamentation of the king about Becket too literally, they travelled to Canterbury and killed Becket in the cathedral. Becket immediately became a martyr for the freedom of the church. On Ash Wednesday on the 21st february 1173 he was canonized by the pope.